Da Nang tourism, it would be a shortcoming if you visit the tourist spots in Da Nang without setting foot to the famous Con market – the famous market in the heart of the city. What time is Con Market open? What do you buy for gifts in Con Market? 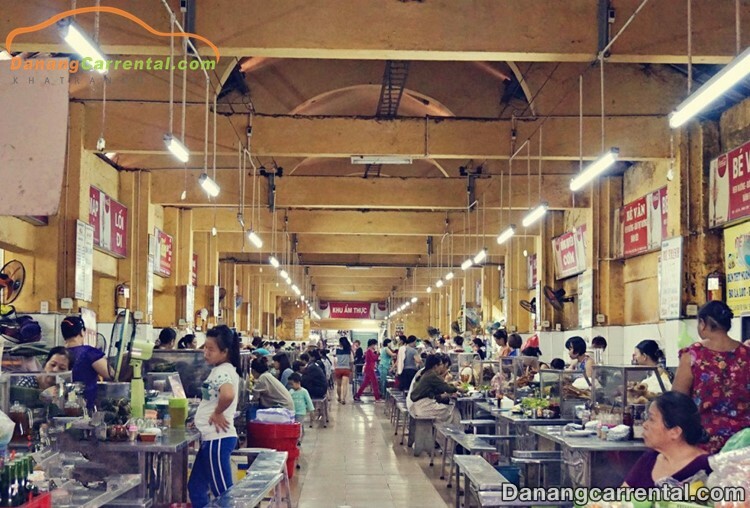 Dubbed the ‘culinary paradise’ of Da Thanh, Con Market is not only a place for local people to trade but also has a special appeal to tourists from far and near. A place to visit, shopping, enjoy food, where visitors can learn the most extensive way of culture as well as the lives of people in the beautiful coastal city. Con Market opened very early for local people to buy wholesale items. 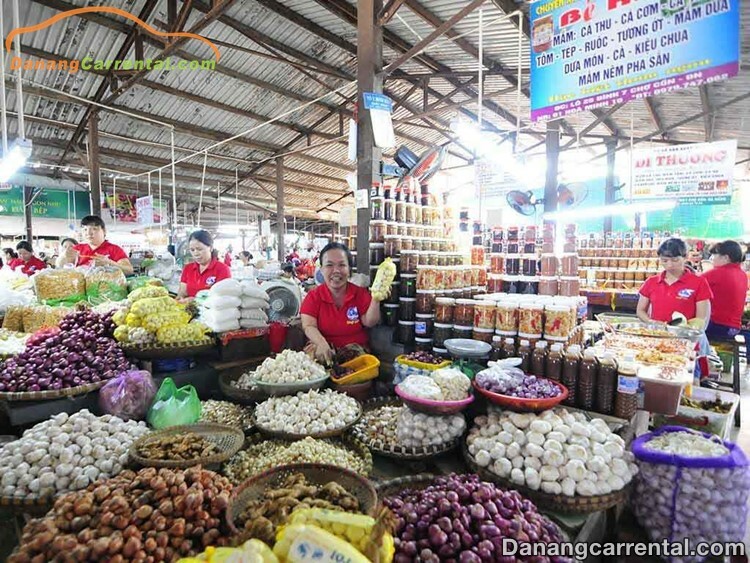 However, the official opening time of the Da Nang market is at 6 am and closes at 20h daily. At present, Con market has more than 2000 business households with abundant and diversified kinds of commodities. 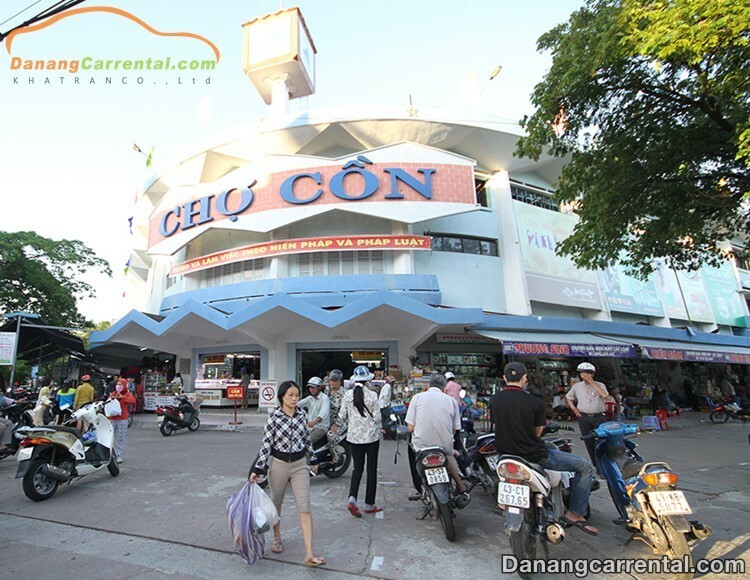 Although many modern trade centers are opened in Da Nang, people still prefer Con Market to any other center. Especially, Con market attracts a large number of domestic and international tourists when coming to Da Nang. When you first set foot here, you will be overwhelmed by here too many food stalls. It can be said that all the dishes from the specialty, famous for the countless delicious snacks of the Central are focused on here. So, Con Market is a “paradise foods” of Da Nang is not wrong! Visitors to Con Market is not only discovering the unique cultural and historical features, learn about the life of people here, but also have the opportunity to enjoy delicious specialties, attractive prices and cheap. As soon as you enter the market gate, visitors will be attracted by the shops selling cakes, vermicelli delicious and eye-catching. As we go inside the market, the dishes are more abundant, ranging from buns, cakes, pancakes, powdered flour, pancakes, rice cakes, little cakes, beef porridge, noodle soup, barbecue meat noodle, fish paste … In addition, Con market also sells many other popular dishes such as durian rolls, dried papaya salad, spring rolls, spring rolls, pork rolls, fried eggs. Especially, the food at Con market is not only appreciated by tourists as a variety but also very cheap. Between VND 5,000 – 20,000 / dish, if you follow a small group, only about 70,000 – 100,000 VND, you can eat full stomach with all attractive dishes. One of the outstanding advantages of Con market is that it is very clean, neat and compared to other traditional markets. The stalls, the cafeteria, even the street vendors have full tables and chairs, which are polished. The dishes are stored in a glass cabinet or covered with food wrap. Only when there are customers ordering the seller to start processing, so the food is always hot and fragrant. Traveling to Da Nang, the main market is not ideal if you want to buy some gifts for relatives, friends. 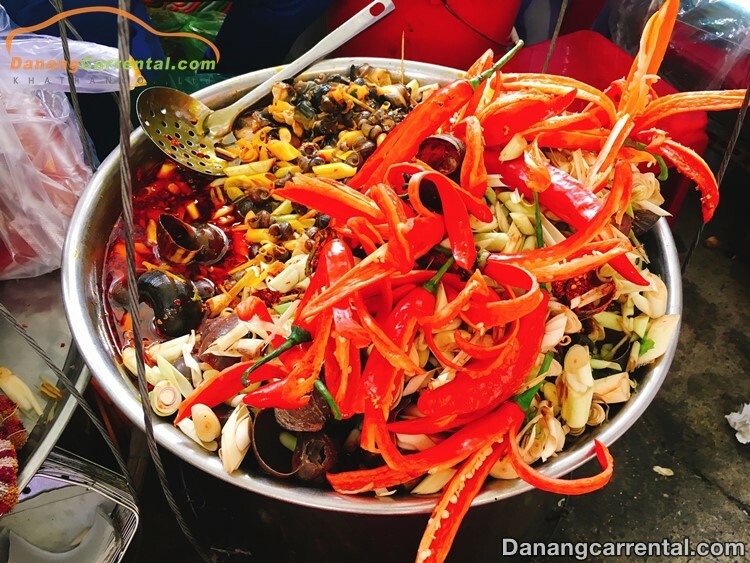 There are all kinds of famous specialties of Danang at affordable prices. According to the experience of the tourist market in Da Nang, visitors can reach the end of the market, near the gateway, there are some shops selling small shrimps, banana leaves can be carried away, or donuts, coconut cake … dried seafood, seasoned fish, dried shrimp, dried squid, Nam O sauce are specialties of Da Nang is loved by many people. Or you can go to souvenir stalls to buy gift souvenir for the tour of Con market or donate to loved ones. Along with the other attractive tourist attractions in Da Nang such as the Han River Bridge, Dragon Bridge, Ba Na Hills, Non Nuoc, … Con market always has its own attractions to visit. Interesting excursion during the trip and enjoy the excellent cuisine of the coastal city and explore the idyllic cultural beauty that the relatives are kept forever in the Con market will certainly be an unforgettable experience. Kha Tran Car Rental hopes that all of above sharing of Da Nang Con Market will be a useful experience for your trip more interesting.We hope to bring you an interesting information in your tour to Da Nang. For more specific advice or rent cheap car to visit famous sites in Da Nang, do not forget to contact Kha Tran Car rental via hotline Ms Anna: (+84) 916510201 or Ms Katharine: (+84) 34 797 6789. Wish you have a fun trip with many memorable experiences.